One of the artists on LiveJournal liked putting together big, flash mob-like projects. He would post his idea and then make assignments once he had enough participants. One time it was a poker deck by 54 artists, another time it was a Monopoly board. The last time big project he commissioned was for a game called Lotería. 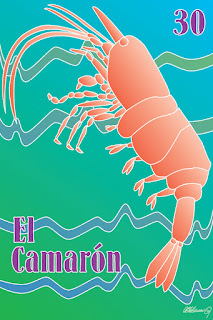 I don't anything about the game at all, alas, but I was assigned El Camarón.